Using the latest in Filament LED technology, this bulb contains six High Power Filament LEDs to produce an output of 550 lumens. 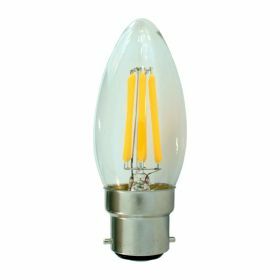 It is drop in replacement for a standard 15mm Bayonet base bulb and has a wide 360 degree light spread all around, even downwards. With an efficiency of 110 lumens per watt, these are amazingly efficient bulbs that give you more light for your money! 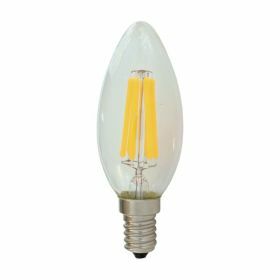 These bulbs are more compact in size than most LEDs, and with filaments encased in a glass exterior, it packs higher power into a smaller package that is appealing to the eye. They are also very lightweight - only 15g each compared to other LED equivalents of 60g or more. In this regard, they are very similar to traditional bulbs - but without the power consumption and heat! These smaller B15 bulbs are common in chandeliers, where multiple smaller bulbs are used, and also in some table and bed side lamps. In either situation, this bulb gives a nice light with a consistent spread - and the wide 360 degrees all-round light spread is an advantage over traditional LED bulbs that only shine light upwards. This 5W LED bulb is equivalent to about a 55W standard bulb. It is also dimmable in most bedside dimming lamps, or in ceiling fittings where 3 or more bulbs are used in the same fitting/circuit, from 0%-100% with our KIWI Mains Wall Dimmer set on Trailing Edge (TE). This filament model is available in 15mm Bayonet (B15), 14mm Edison Screw (E14), 22mm Bayonet (B22), and 27mm Edison Screw (E27).